Total Score: 8.42 - EDITORS CHOICE! Introduction: Is there really room for another premium fly reel manufacturer? The team at Hatch thinks so and their lineup of reels are designed to address things they felt were missing in existing competing offerings. 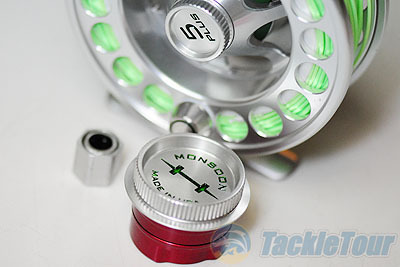 The Monsoon 5 plus is designed to be a �do it all� reel and makes use of some interesting design concepts to create a reel that is looking to change the definition of �high-end� fly reels as we know it. 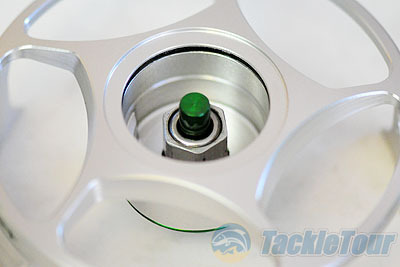 Impressions: I first learned about Hatch when researching new reels for Steelhead fishing. 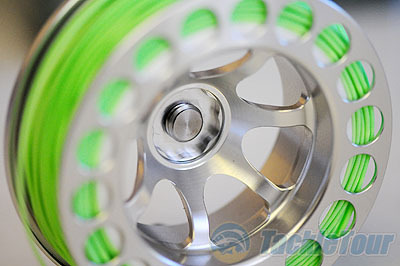 I wanted a reel that could deliver more drag pressure but still would feel lightweight. I have fished many Abel, Nautilus and Galvan reels but the minute I saw the Hatch reels I knew I had to try them. I immediately liked the porting on the reels as well as the work done to make the frame truly one-piece, but more on that later. The first thing I needed to do was procure the reels, so I headed to the California Fly Shop and bought two of them retail, at 500 dollars apiece the total setup was 1200 dollars once they were spooled up with backing and Scientific Anglers branded line�.ouch. We purchased two reels so that we could compare the reel with two different wt. lines side by side. The 5 Plus is described as the company�s workhorse reel and can accommodate line weights from 5 to 7. Because the reels are available with different color highlights it was easy to discern which was which. There are four color combos available in all. Three of them are silver with different color logos and one of them features the more traditional looking black/silver combination. Before we get into the details of the reel itself its worth taking a moment to note the attention to detail Hatch put into the entire package. While most fly reels come in a simple cardboard box with their logo silkscreened on there for identification (if you�re lucky), Hatch has put together a total bundle that is more like unboxing a fine watch than a fly reel. Inside printed tin anglers will find the 5 Plus mounted within a cardboard seat with a registration card and instructions as well as an Allan wrench for servicing the reel. The spool comes in a neoprene pouch that is lined with sheepskin. 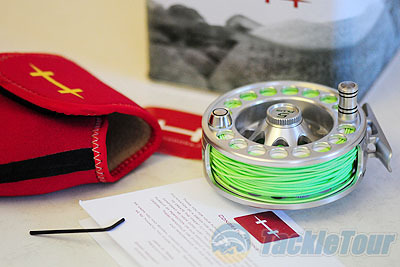 This is one package worth keeping and the tin makes a good place to store your reel when it is not in use. 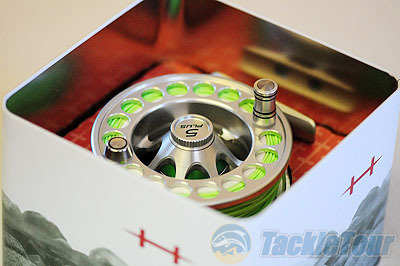 Once you get past the packaging you will note that each reel is aggressively ported on both the frame and spool. 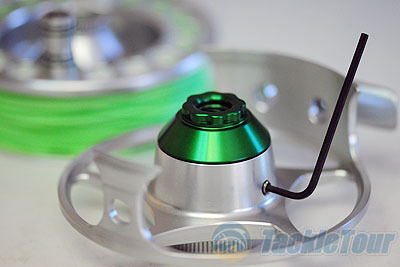 The feature that most attracted me to this reel at first glance is the reel foot which is machined out of the same piece of aluminum, I�m talking 1 piece not two. Unlike other reels where the reel foot is bolted on the top of the reel Hatch machines the foot right on top of the frame so there are no screws. This reduces total weight to a minimum and eliminates one more point of failure where the reel foot might loosen or the screws could possibly corrode. The spool attaches to the frame via a single bolt, much like a wheel on a GT car. 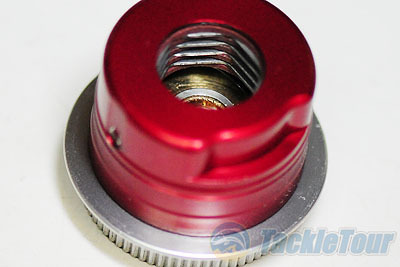 This allows for quick and easy spool changes. 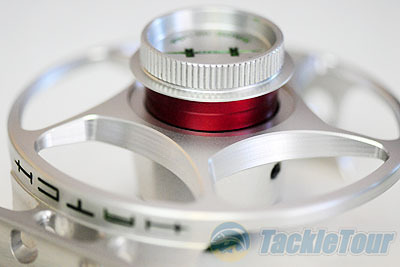 On the other side of the frame is the drag knob which features clicking adjustment. Real World Test: To test the 5 Plus reels I traveled from the Smith River on the Oregon border all the way to Pyramid Lake Nevada, fishing in both rivers and lakes pursuing everything from Browns to Lahonton Cutthroat trout and Pacific run Steelhead.